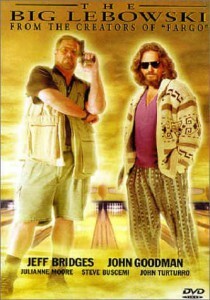 The Dude (Jeff Bridges) is a bearded slob. His casual hippie-esque drawl is peppered with profanity and he calls almost everyone he meets, male or female “Man”. When “dressed up” he might wear a t shirt and shorts, this is not often. Standard attire is an open robe and slippers. The Dude hasn’t worked for some time and he lives a simple, meagre existence in rented accommodation with few friends. 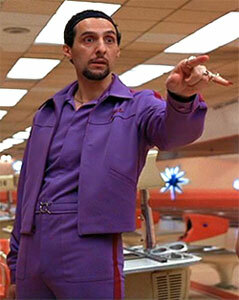 His only non-negotiables are bowling and White Russians, an alcoholic beverage. The Dudes only known friends are his bowling buddies, members of a league team, a league that they take extremely seriously. 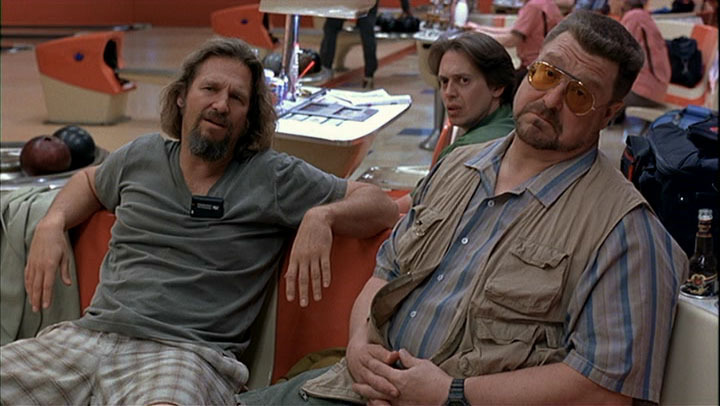 (There are many scenes in this film set in the bowling alley during play, however we only see one of the team ever bowl, three bowls from memory.) Speaking of the team, aside from The Dude we have Walter (John Goodman) and Donnie (Steve Buscemi). Walter is loud, opinionated and obnoxious, not exactly a winning combination, but he is loyal to The Dude and even though he frequently gets it wrong he seems to want to do the right thing. He treats Donnie with disdain and almost always brings everything back to a Nam story. Donnie is the opposite, simple, friendly and curious, he is always questioning and inserting randomly pointless comments into proceedings (“I am the Walrus”). The bowling team, STFU Donnie! 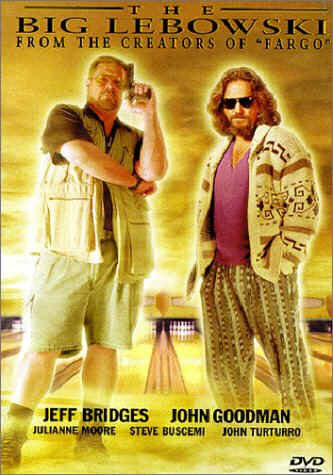 The fun starts with a case of mistaken identity, a message made for a Lebowski is served to the wrong Lebowski being The Dude’s AKA, this leads him in turn to the right Lebowski, specifically the Big Lebowski for a chat. The chain of linked but totally unpredictable events that follows this simple mistake are realistically largely irrelevant to your enjoyment, aside from facilitating the introduction of various characters and providing The Dude and often Walter with a purpose for a short time. The convoluted plot is often broken up with insane yet totally entertaining dream sequences, generally bowling related and short sequences involving red herrings and bit characters, not the least of which is named The Jesus. NOBODY fucks with the Jesus!! – A ransom request leading to a botched payoff. Though you will be relieved to know that come the conclusion of the film the bowling team does make it to the finals… or maybe that was a spoiler? Final Rating – 8 / 10. Never has a throwaway film been this indisposable. Apparently this is a “Ya get it or ya don’t” film, I myself can’t see why ya wouldn’t wanna get it.